This story is about possibly the biggest scandal of the decade spawned by the combination of a greedy businessman, a lackadaisical regulator, ever-willing investors looking to become millionaires overnight, shrewd politicians and cunning but easily pliable bureaucrats. The story is about the unregulated and reportedly illegal National Spot Exchange Limited (NSEL). A story of billions of rupees changing hands in the name of the farmer but there being no produce or storage in the market, yet the commodity— which cannot be legally traded—being traded. It’s an amazing story of a small-time trader, Jignesh Shah, who manipulated the NSEL while fooling almost everyone in the system. The NSEL is a classic case of the failure of governance in India—of a non-existent regulator and conniving bureaucrats and politicians, and every technique worth the name being used to deceive and trap greedy investors to make billions overnight. 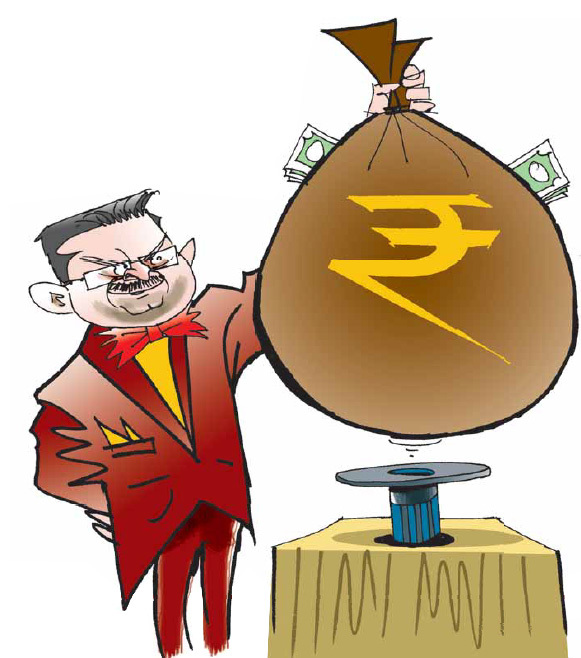 Who is behind Jignesh Shah, sharing the booty of the loot—a veteran Maratha politician, or the entire financial governance system, or greedy business houses? How can a governance system be so toothless that not even a single FIR is registered against the alleged fraudsters? What is the government waiting for? Where has the money gone? Who will account for it? The NSEL is a sordid saga of loot, treachery and defiance of the government. Are we waiting to solemnise this loot, or are we allowing Jignesh Shah to go scot-free for reportedly creating a mess in the financial system? If this malaise is not corrected, the day is not far when the stock market matrix may collapse — for, make no mistake, there are many Jignesh Shahs watching, ready to exploit the governance system that appears to be helpless, toothless and defunct. Anil Tyagi and Neeraj Mahajan take you into the treacherous world of the NSEL and explain how the governance system can be taken for a ride by anybody with the right kind of network. In the coming months, this will have a cascading effect on the already struggling financial market. There was an alarming mismatch wherein the exchange had only Rs 65 crore in its corpus as against the transaction value in excess of Rs 6,500 crore. This raises questions: can the NSEL escape the noose by arranging to settle the contract value between the parties? Who approved the system of margins in the clearing house? Is the Settlement Guarantee Fund (SGF) adequate for sudden adverse events? Was it subjected to a stress test? Should non-defaulting brokers be deprived of margins lying in SGF due to recklessness of others? where large number of suicides have happened due to the heavy losses faced by investors’ caused by manipulative practices of those in control of such exchanges. where clear evidence has been found of price rise of essential commodities due to purely speculative nature of transactions wherein a particular agricultural commodity is bought in a quantum not even produced by the entire nation. where trade worth billions of rupees occurs in various commodities without culminating in practically any delivery. where such exchanges have not only become gambling dens but have also become an effective conduit for money laundering, tax evasion and other such criminal activities. and where it is almost impossible to operate computers, terminals, etc., as it is in the public domain that rural India does not have adequate electricity supply. These questions are raised because of the possibility of a billion-rupee scam, allegedly robbing investors, by the Financial Technologies India Ltd (FTIL) – promoted Commodity Exchange. Rs 5,600 crore appears to be a small amount in scam-ridden India where scams of Rs 40,000 crore or Rs 50,000 crore are routine. But the scam of the National Spot Exchange Ltd (NSEL) commodity exchange in all probability — if the investigation is conducted diligently — may surpass Rs 1 lakh crore. 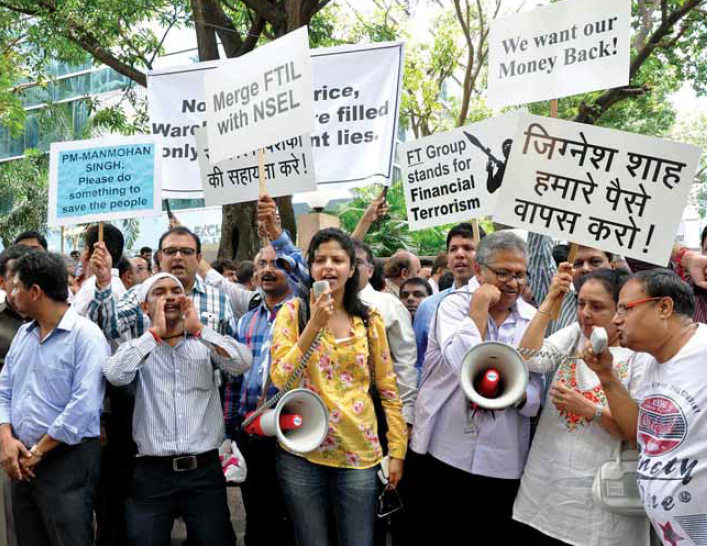 The mayhem was triggered by the FTIL-promoted National Spot Exchange Ltd (NSEL), that suspended trading of all one-day contracts on July 31, 2013, without assigning a clear reason. Surprisingly, the Spot Exchange has largely been an unregulated entity. It is only after the crisis that the Forward Markets Commission (FMC) stepped in as a monitoring agency. Market reports suggest that it is not just a scandal of Rs 5,600 crore outstanding, but that the multiplier effect of the alleged mess in the exchange is going to be around Rs 1 lakh crore. The FTIL is a fit case of mis-governance, connivance of leaders and bureaucrats, and the failure of the regulatory mechanism of India. It is like daylight robbery where, from top to bottom, everybody is aware about the scam but opts to be a mute spectator. 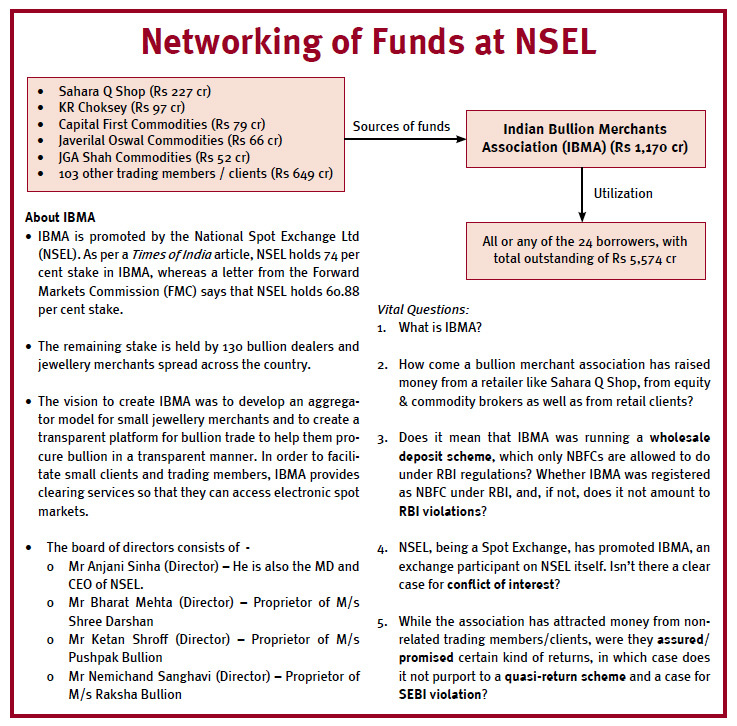 The NSEL was born and allowed to operate in the spot market. It was specifically forbidden to offer forward contracts, or to short-sell products. The NSEL operated with regulatory exemption from the government, based on riders such as a ban on long-dated contracts and short-selling. But it allowed trading of products that were never approved by the government and that, in the eyes of many, virtually offered assured returns and helped boost volumes till the Consumer Affairs Ministry stepped in, forcing the Exchange to provide an undertaking that it would not launch any more contracts and that all existing contracts would be settled on due dates, besides stopping a payout to brokers. This led to a settlement crisis. The fact is that a market for immediate trading of commodities, the equivalent of a cash market in stocks, began functioning as a forward market with lax settlement rules. Apparently, every transaction of buy and sell was paired with one leg beyond the specified spot settlement cycle of two days after the trade (T+2). And the NSEL contracts settled within T+10 days were defined as ‘spot’, but could be carried forward, dodging Forward Market Commission (FMC) regulations, with settlements going as far ahead as T+35. The buyers benefited from an increase in the value of their positions and they took profits by selling at higher price within the T+35 period. The speculators lost money when prices slumped below the original contract value, but on the settlement day they had the incentive to renege on their pay-in. The NSEL launched a number of one-day forward contracts, but some of them were being settled after as many as 36 days after the date of transaction. The supposed reason for the delayed settlement was that one had to account for the peculiarities of certain commodities and time and effort were required to deliver them physically to specific locations. It’s become evident through multiple sources, including regulators, brokers and users of NSEL products, that most of the trading on the Exchange centred on the so-called pair trades to generate annualised returns of 14-15 per cent, without assuming any commodity price risk. Investors bought a near-term settlement contract with a T+2 settlement, and another one with a T+36 settlement was sold simultaneously. The difference in the price of the two contracts — the interest paid to defer payment — was the return for the financier. When the near-term contract was settled, investors became the owners of a warehouse receipt of the commodity purchased. This was effectively pledged to the Exchange for the second leg of the transaction — the sale transaction to be settled 36 days later. So far, so good. However, the problem — and this is the reason the Exchange is suffering currently — is that the buyer of the 36-day contract (effectively, a borrower of funds if he also sold the near-term contract) was levied inadequate margins for the risk he posed to the system. According to the head of a leading domestic trading house, the margins of 10 per cent were woefully inadequate, considering that the underlying asset was fairly ‘il-liquid’. It’s quite evident that the Exchange cannot liquidate stock and settle with trading members with net short positions. Its stock position in some commodities, such as wool and sugar, is fairly large and will drive down prices if they are dumped en masse. In an ideal scenario — in an Exchange which practises robust risk management — trading members with open positions should have been levied margins of at least 40-50 per cent to compensate for the liquidity and price risk of underlying commodities. Of course, this would have caused investors’ returns to fall from the lucrative 14-15 per cent, but adequate margining would have helped avert the current crisis. Behind these trades was the NSEL guarantee of settlement and it should, therefore, be legally bound to pay, whether or not counter parties pay in. There was an alarming mismatch wherein the Exchange had only Rs 65 crore in its corpus as against the transaction value in excess of Rs 6,500 crore. This raises questions: can the NSEL escape the noose by arranging to settle the contract value between the parties? Who approved the system of margining in the clearing house? Is the Settlement Guarantee Fund (SGF) adequate for sudden adverse events? Was it subjected to a stress test? Should non-defaulting brokers be deprived of margins lying in SGF due to the recklessness of others? Should the liability of the NSEL be limited to the corpus in SGF that comprises the collection of margins of the members? And were margins collected from beneficial owners of positions since spot contracts have morphed into forward contracts or futures? Close to 13,000 investors have lent money through the Exchange platform to less than 25 borrowers, using a two-legged buy/sell contract that the government and the FMC found illegal. None of these high net-worth individuals would have lent money to a group of little-known borrowers, had it not been for the Exchange. The product operated like a vyaj badla scheme, where money was lent in exchange for warehouse receipts and repaid after 25 or 30 days when the receipt was returned to the borrower. However, in most cases, the contracts were rolled over beyond 25 days, with the lender collecting just the interest amount. Incidentally, such long-dated contracts, essentially in the form of forward contracts, were criticised by the FMC in 2010 and 2011, during the chairmanship of BC Khatua. The regulator even wrote to the government to restrain Spot Exchanges from dealing with such forward contracts and to allow the FMC to regulate these Exchanges. The government did not heed this, said Khatua. Jignesh Shah — the uncrowned king of the Indian financial world — can be compared to the emperor in Hans Andersen’s fairy tale, The Emperor’s New Clothes. The emperor was presented a new, invisible, suit by two weavers, who claimed that on wearing it he would be able to spot ‘stupid’ and ‘incompetent’ people. The emperor decided to go around the kingdom wearing the special suit. Everyone kept praising the new suit till a child in the crowd yelled, “The Emperor is not wearing any clothes at all!” The greatest tragedy in our democracy is that many people observe things but don’t wish to stick their necks out, while others prefer to remain silent spectators. As a result, few malpractices are spotted and none are punished.Jignesh Shah wants to be the new-age avatar of Kuber, the God of Wealth. He deals with tonnes of money every day and dominates all of India’s assets: equities, currency, commodities, derivatives, power and precious metal — gold, silver — and the forex trade. He is so powerful that many politicians dare not defy him and bureaucrats bend backwards to please him, in return for a post-retirement job. He runs a parallel government, where his wish is law. He gets what he wants and anything he doesn’t want, rarely happens. A smile or frown on his face can strengthen or devalue the ‘bhav’ of the rupee, crude oil or agricultural commodity. He is ambitious and wants to accumulate all possible wealth and power, that too quickly (see MCX: Who’s Who). FORMER Director (Stock Exchanges) in the Department of Economic Affairs Paul Joseph, who retired in 2008 and joined Jignesh Shah, the promoter of the National Spot Exchange Ltd (NSEL), soon after, signed a notification dated June 5, 2007. It is this notification that helped the NSEL take advantage of the technicality of ‘one-day forward’ contracts and launch spot markets across the country. The NSEL went live on October 15, 2008. Though the plea taken was that the amendment would help farmers get better prices, as the regional terminals where farmers bring their produce are controlled by cartels that beat down prices, in actual terms it placed the functioning and control of NSEL Spot Exchanges outside the purview of the Forwards Markets Commission (FMC) and without clear-cut powers of the Centre or the States to regulate it. Also, the fact that the notification stated, “NSEL’s operations are subject to regulation by authorities regulating spot trade” added to the confusion. To undo the damage done by Joseph, the Department of Consumer Affairs issued another notification on February 6, 2012, appointing the FMC as the designated regulatory agency for the National Spot Exchange. Technically, now, for any forward contract, the NSEL had to seek the FMC’s permission. But it was too late in the day and the damage was already done. The notification of February 6, 2012, made another amendment to the Forward Contracts (Regulation) Act, or FCRA, stipulating that all information or returns relating to trade, if requested for, are to be provided to the Centre or the FMC. This, again, seems to be a weak law which speaks only of providing information or return of trade. There are no powers for search and seizure. Thanks to men like Joseph, the NSEL made the most of the regulatory vacuum to set up spot trading operations in 52 commodities, including bullion (gold, silver, platinum), agri-products (cereals, fibres, spices), metals (steel, copper) and energy (coal, etc) in 16 States. The NSEL’s good fortunes can be attributed to the fact that it was virtually allowed to run the race without any controls, checks and balances, in a regulatory vacuum from 2007 till February 2012. This initial leap or unfair advantage helped it to capture 99 per cent of the market share. Jignesh Shah has more, better informed, motivated, committed, mature and senior people experienced in government and public affairs reporting to him on a daily basis than the government. They understand the mindset, have a finger on the pulse and possess in-depth knowledge about the Government of India, particularly the finance ministry, RBI, SEBI and FMC. It just takes a phone call for them to find out the latest development or a loophole in a new government policy. They are his eyes and ears and crisis managers who manage the Government of India for him.One such officer is Paul Joseph, a 1971-batch IES officer who served as Director (Stock Exchanges) in the Department of Economic Affairs, Ministry of Finance and Ministry of Corporate Affairs for 38 years. He retired as Principal Adviser (equivalent to Secretary, Government of India), Planning Commission, and is now employed as Principal Adviser in MCX. As a Senior Economic Adviser in the Department of Consumer Affairs (level of special secretary), he was monitoring the commodity markets and commodity exchanges in the country. It is a clear case of conflict of interest as Joseph, who spent most of his career investigating fraudulent practices, is now advising MCX on bypassing legal hurdles. Significantly, the Department of Consumer Affairs, Ministry of Consumer Affairs, Food and Public Distribution, Government of India, issued a Gazette notification, dated June 5, 2007, making an amendment to Section 27 of the Forward Contracts (Regulation) Act, 1952 (FCRA), exempting all one-day forward contracts of the NSEL from the provisions of the FCRA, subject to certain conditions. Clause 3 of the amendment stated that NSEL would be subject to “regulation by the authorities regulating spot trade in the areas where such trading takes place”. Commodity trading was completely banned in India in the 1970s. It was lifted 33 years later in 2003, only after the Doha Accord came into effect. What was said at Doha, or WTO, was that there should be common commodity markets and others should also be allowed to sell their products in India. There was no international pressure to create electronic platforms and cheat others. The National Agricultural Policy of the Government of India in 2000 specified the need for a futures exchange for better price discovery and removing fluctuations in prices. But, in the garb of benefits from trading in commodities, the whole approach was to make money and to allow others to do so also. All this was hardly done to benefit agriculture, as similar recommendations by the Dantawala Committee (1966) and the Khusro Committee (1980) were gathering dust. Finally, the Government decided to act on the Kabra Committee (1994) report, which recommended opening up of the futures trade in 17 selected commodities. Strangely, the Kabra Committee’s recommendation not to allow futures trading in wheat, pulses, non-basmati rice, tea, coffee, dry chilli, maize, vanaspati and sugar, fell on deaf ears. This was despite a suggestion by UNCTAD and the World Bank Mission Report that futures trading in commodities like wheat, rice and sugar was unlikely to be viable.Meanwhile, the Vajpayee government instituted the Guru Committee in 2001, which recommended that it should be left to the exchanges to decide the usefulness of futures trading in products and commodities, based on feasibility studies on a case-to-case basis. “All commodities are not suited for futures trading,” it added. But one fails to understand why the Government still opened up 54 prohibited commodities for forward trading, including sensitive commodities like wheat, rice, sugar and pulses. 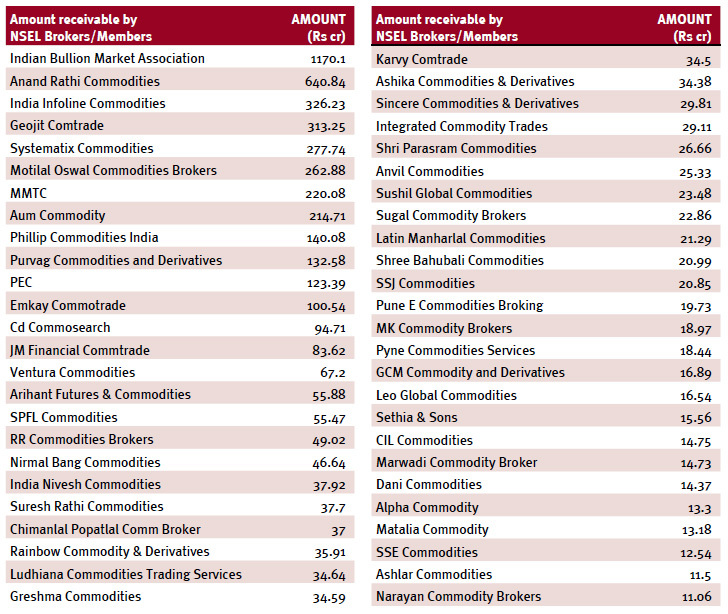 Obviously, all these were sops to make the commodity derivatives market seem lucrative to the private players. JIGNESH Shah — a virtual nobody with practically no experience in commodity trading — was given the clearance to start a commodity exchange in 2003. Thanks to the administrative push as well as a good measure of political and bureaucratic thrust, he is today the uncrowned king of the trade in less than a decade. This was his greatest advantage, while his competitors were side-tracked, even derailed by official roadblocks. Jignesh was born in a humble Gujarati Jain family of Prakash Shah, a small-time iron-steel and chemicals trader, who migrated from Gujarat to a middle-class suburb in Kalbadevi, Mumbai, in search of a fortune in 1963. Jignesh and his two brothers, Manish and Manjay, studied in a nondescript neighbourhood Gujarati-medium school with the help of borrowed books. After doing electronics engineering, Jignesh managed a job in the Bombay Stock Exchange (BSE). This is where he met Dewang Neralla, who was a deputy manager with the BSE. Both of them were sent abroad by the BSE to study new technology and explore opportunities for developing software for online exchanges. 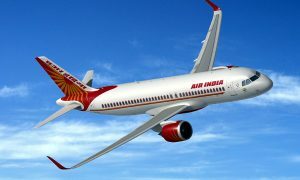 But, after returning to India, they decided in 1995 to start their own company, called Financial Technologies India Ltd, with a capital of Rs 5 lakh, in association with Joseph Massey and Anjani Sinha. As things stand today, within less than a decade, Jignesh Shah controls all assets — equity, equity derivatives, currency derivatives, commodities and interest rate futures — traded on exchanges in India. In 1999, KC Mishra, the FMC Chairman, gave permission to a consortium led by Punjab Warehousing Corporation (PWC), National Stock Exchange, Mahindra & Mahindra and ICICI, to set up a National Futures Commodity Exchange. They were to set up the exchange by 2001. This consortium had all it took to set up a commodity exchange — NSE’s domain knowledge, PWC’s warehousing, ICICI’s capital and Mahindra & Mahindra’s marketing infrastructure. It was a question of deciding whether to operate from Punjab or Mumbai. 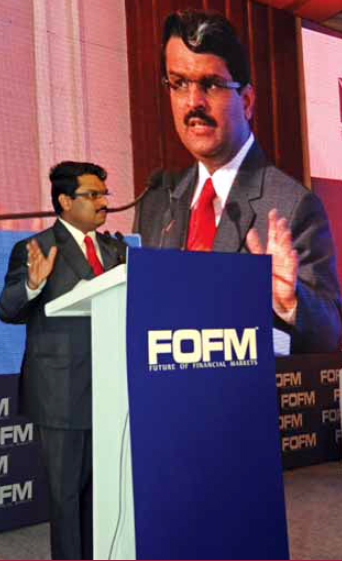 Two years later, Dr Kewal Ram, the then FMC Chairman, kicked the consortium out of the race. The FMC started looking for fresh applicants. It is besides the point that Dr Kewal Ram was actually looking for an opportunity to grant a licence to the Indian Commodity Exchange Limited, an online derivatives exchange promoted by Reliance Exchangenext Ltd and Indiabulls Financial Services Ltd, and that he is now on its Board of Directors. JIGNESH Shah’s powerful friends and pillars of his strength include Pranab Mukherjee and P Chidambaram, who inaugurated his MCX-SX. It is reported that Pranab Mukherjee — when he was Finance Minister — ensured Jignesh Shah remained out of the purview of the Commodity Transaction Tax (CTT), which is like STT, which you pay each time you buy or sell a share. Though there is no difference between an equity and commodity transaction, commodity trading was exempted from tax on the ground that commodity trading helps the farmers. It is a different story, though, that agricultural commodities are a minuscule part of MCX’s trade and that hardly any farmer benefits from commodity exchanges. 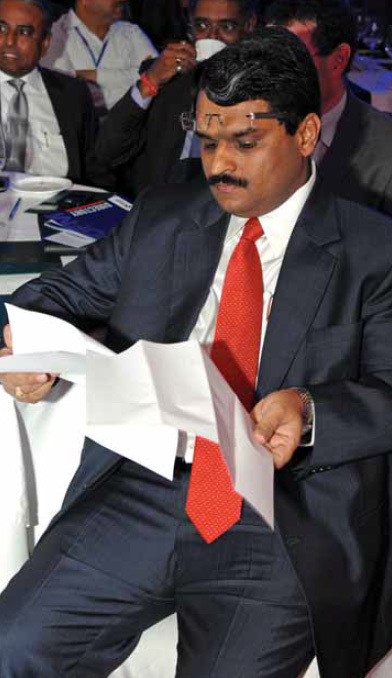 Other friends of Jignesh Shah include the three powerful Sharads — Pawar, Joshi and Yadav. Sharad Pawar, the NCP leader, six-time MP, former Maharashtra Chief Minister and present Cabinet Minister, is one of Shah’s strongest supporters and allegedly his political mentor. Apart from Pawar, Shetkari Sanghatana founder Sharad Joshi and Sharad Yadav, who was Union Minister for Consumer Affairs, Food and Public Distribution in the Atal Behari Vajpayee government— at the time when the ban on commodity exchanges was lifted — have stood by Jignesh Shah through good and bad times. It may be recalled that when Finance Minister P Chidambaram tried to introduce the CTT in 2008, the Food Processing and Consumer Affairs Ministry objected strongly, saying that CTT would hurt agri-markets. As a result, Chidambaram had to withdraw the CTT. MCX’s average daily trading volumes have risen by 40 per cent every year since 2008. On the other hand, the average daily turnover on stock exchanges nosedived from Rs 59,615 crore in FY 2007-08 to Rs 43,118 crore in FY 2011-12, a decline of 27.67 per cent. During the same period, average daily non-agricultural commodities futures turnover rocketed from Rs 10,277 crore to Rs 50,147 crore, a growth of 387.95 per cent. This is just one of the many instances of Jignesh Shah and MCX profiting by seemingly managing the government. To make this happen, Dr Kewal Ram issued a press note inviting corporates to apply. There were 17 criteria and 16 applications from almost all major stock exchanges. Dr Kewal Ram, as the FMC Chairman, played a part in keeping some of the strong contenders like NSE, Nabard and LIC out and instead recommended four names: ICICI, MCX, NMCE and NBOT (Indore), the only working regional exchange. Two of the applicants, ICICI and MCX, were without any commodity trading background and both (today’s MCX and NCDEX) were thrown out. What followed was a round of hectic lobbying. Jignesh Shah reportedly met the Economic Adviser, Secretary, Joint Secretary and Sharad Yadav, the then Consumer Affairs Minister. Obviously, when you are the Minister’s blue-eyed boy, who can stop you? It is reported that, as a via media, a World Bank consultant was asked to give a report. His recommendation was reportedly used to overrule the objections to MCX and NCDEX proposals. What proved to be another blessing in disguise for Jignesh Shah was that Sharad Pawar became the Union Minister for Consumer Affairs on May 22, 2004. L Mansingh, who succeeded Navin B Chawla as Secretary, Department of Consumer Affairs, ensured that NBOT, Indore, the only existing regional exchange, was kept out of the fray. JIGNESH Shah controls the fuse box that can smoothly run or short-circuit the Indian financial markets. Should one person be allowed unlimited powers to bend, swing or impact the stock markets, gold, silver, energy, currency, commodity, derivatives and foreign exchange trade in India? 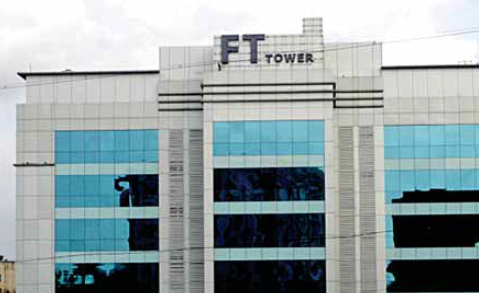 Even today, a majority of his rival NSE and BSE brokers use FTIL software. His clout and market dominance can be judged from the fact that, leave aside MCX and MCX SX, even arch rivals like NSE, BSE, NCDEX and NMCE would come to a standstill if there is even a slight glitch in FTIL’s Open Dealer Integrated Network (ODIN) — a computer-to-computer link offering real-time connectivity, faster inter-segment trading and back-office operations to India’s leading commodities and derivatives traders, stock exchanges, trading institutions, brokerages and banks. The Honourable Court is requested to decide whether Jignesh Shah should be allowed to be the undisputed king of the Indian markets — whose sneeze alone is enough to make everyone catch a cold. Perched at the vantage position that he is in, he has the power, money, opportunity and contacts to make the Indian financial world dance to his tunes. At the time when MCX got the go-ahead on February 14, 2003, both its competitors, the National Commodity & Derivatives Exchange (NCDEX) promoted by ICICI, LIC, NABARD and NSE, and NMCE, supported by Neptune Overseas, CWC and Gujarat State Agricultural Marketing Board, were nothing less than giants. But, thanks to the hidden support of powerful friends in the Government of India, MCX grew faster than the overall industry and became the dominant commodity exchange with 86 per cent market share. Interestingly, the next largest player has only 10 per cent market share. Arbitrarily lifting of the 33-year ban on commodity futures, even against expert advice. Approving of new exchanges while allowing existing traditional ones to close down. If the real purpose was to promote commodity trading, then existing regional exchanges could have been allowed to modernise. Allowing a few companies to monopolise the market. Removing legal hurdles to increase the scope of commodity derivatives trading in India. Increasing the list of commodities as well as trading volumes on the national commodity exchanges. Not exercising all powers to enforce a strong regulator. As a result, 13-year-old stock markets have a stronger regulator in the form of SEBI than the 61-year-old FMC in commodity trading. Amendments to the Forwards Contracts (Regulation) Act, 1952, giving more powers to the FMC, are hanging fire for the last several years. The National Multi-Commodity Exchange of India Limited (NMCEIL) managed to get the permission to start trading in edible oil as the first de-mutualised, Electronic Multi-Commodity Exchange, on July 25, 2001. It was recognised on October 2002 and started on November 26, 2002. Kailash Gupta, the founder of NMCEIL and who crossed the line and upstaged MCX by starting the first countrywide electronic commodity exchange in India in 2002, a year earlier, has been behind bars for the last five months. Likewise, NCDEX’s file was kept pending to allow Jignesh Shah a head-start. Though both got the clearance around the same time, NCDEX was kept on hold till December 15, 2003 – one month after the launch of MCX. What’s amazing is how a man who started his business with just Rs 5 lakh and had no experience and expertise, was in a position to get such favours and allegedly block opponents. The fact that he managed to go live in a record nine months, on November 10, 2003, demonstrates his strength. Even at the time when licences for commodity exchanges were given, the Government of India seemed to be in a tearing hurry to start off on a war footing, without providing a proper regulatory mechanism and amendments to the FCRA rules of 1950 vintage, at a time when there were no electronic exchanges. It was as if tomorrow would never come. The Government of India played the role of Santa Claus and seemingly allowed Jignesh Shah to exploit virtually every loophole in the system to capture the market. Almost like a car without brakes or speed governor gathering momentum on an inclined plane, MCX prospered from the initial push and supportive environment without any real competition or regulatory hurdles. 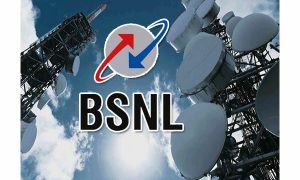 Within 2-3 years of commencing operations, its turnover skyrocketed 120 times and the total volume of trade rose sharply from Rs 1.29 lakh crore in 2003-04 to Rs 27.39 lakh crore in 2006-07. The daily average volume of trade in the commodity exchanges in December 2006 was Rs 12,000 crore. Gold, silver and copper recorded the highest volumes of trade in MCX on December 31, 2006. MCX emerged as the largest commodity futures exchange during 2006-07, both in terms of turnover and number of contracts. The most important issue in this alleged fraud is where all the money has gone. To which accounts was the investors’ money, running into Rs 5,600 crore, transferred, and where has it gone from those accounts? Who will investigate it? Will it ever be recovered? How did the trade guarantee of Rs 800 crore shrink to Rs 65 crore and then to just Rs 5 crore? Who did the margin money belong to and who has appropriated it? Why didn’t brokers, and even investors, question the trade earlier? With the counter-party risk for the transaction being guaranteed by the Exchange, the trade itself should have raised question marks. Why do the prices only move up? Generally, prices of assets and commodities fluctuate, or move up and down. It is observed that greed was the mantra with investors looking at their end payoff, which may not reflect in the actual market price, but no one was bothered as long as they got the promised 12-15 per cent return. How did the price of one commodity rise 1-1.25 per cent in every trade cycle in a matter of 25-30 days, regardless of what the underlying commodity was? Who was selling it? Was it investment/trading or a lending activity? The answer lies in the fact that the profit was not so much through the change in the price of the commodity; rather, it was through the interest which borrowers (commodity growers, or suppliers, or owners of warehouses) pay for the liquidity provided. This simply means that you aren’t really investing/trading in a commodity, you are just lending money. You don’t really need an Exchange to do this and that is not the purpose of an Exchange, in any case. While investing money, you need to assess the viability of an asset, a business, the growth of an industry or the economy; but lending money to a third party without verifying credentials is simply not trade. A market Exchange works because investors and brokers are confident that the Exchange will ensure that the counter-party risk is minimised. It would be impossible for investors in a commodity Exchange to verify the presence of commodity stocks in warehouses. They used warehouse receipts (in many cases, just soft copies) for each leg of the trade, with the confidence that they were dealing with a so-called regulated exchange. Why did the regulator not verify the antecedents of warehouse locations, owners and quantity produced in India and stored in warehouses? Why did SEBI not take any action against the promoters of MCX-SX, who forfeit the tag of ‘fit and proper’ to run an Exchange, and this happens to be the ground-level regulator itself? Why has the corporate veil not been lifted and promoters not been made liable to pay the entire dues, in the wake of promoters being found to be engaged in an obvious act of deceit, cheating and fraud, and why have their personal assets not been frozen till date? Why have no FIRs been filed under the Negotiable Instruments Act for bouncing of cheques by the defaulting parties? Why have the promoters of NSEL, including Jignesh Shah, not been arrested despite the frauds surfacing regarding the missing commodity stocks and circulation of fake warehousing receipts, and also for filing fake and false information with the regulator time and again? Were the Know Your Customer (KYC) norms followed for enlisting brokers, sub-brokers and investors, etc? How could the companies, promoted just a few days back and having a meagre capital and asset base, acquire positions worth hundreds of crores in a matter of a few days without the active connivance of the promoters and management? Why has it not yet been investigated and disclosed as to who were the brokers through whom approximately 24 borrowers took the money, since no buyer and seller can directly trade in an Exchange? Why is the RBI silent and has not yet taken any action, since pure financing schemes were happening in the Exchange, like a repo or repurchase of securities in commodities, which the law prohibits? Why have till date the role of directors especially independent directors, who were the best of the brains from the financial world and were handsomely paid, not defined? Was it because they lacked control, or they genuinely failed to exercise supervision, or they were not competent, or they were appointed with an understanding to facilitate the misdeeds of Jignesh Shah and Company? Why did no one at any stage point out whether the basic norms of corporate governance with regard to the functioning of the Board, the Audit Committee and so on were followed or not? How could NSEL continue to make the fraudulent disclosure of it being a national level, institutionalised, electronic, transparent spot trading platform for commodities having licences from Maharashtra, Gujarat, Madhya Pradesh, Odisha and Rajasthan whereas its licence was cancelled under the Agriculture Produce Marketing Committee Act (APMC Act) way back on December 26, thereby prohibiting it from operating as a market in Maharashtra due to gross violation of various provisions? How did NSEL operate by appointing agents on its behalf in gross violation of the APMC Act that provides a private market licence which is not transferable? Why did no one raise fingers at the functioning of the exchange and doubt the financial prudence when the largest borrower at the exchange happens to be the son-in-law of the chairman of the exchange and the promoter’s brother- in-law? Why, in contrast with the swift action taken in the Satyam scam, that helped retrieve the investments of thousands of investors, did the government prefer to be a mute spectator or, rather, tried to hush up the matter by appointing committees and has already lost precious time that can be used by the promoters to squander the money and manipulate the records? Why has IBMA, promoted by NSEL and bullion dealers, been trading on MCX and derived significantly large exposure despite rules spelt out in the circular dated July 29, 2009 stating clearly that the shareholders of the exchange shall not have any trading interest either as trading members or as clients of the exchange? Was it privy to trade information that other traders or investors did not have and thus misused its privileged position to make extraordinary gains? Was it ethical to appoint IBMA as a clearing member or clearing agent despite it being a promoter group entity? The Warehousing Development and Regulatory Authority (WDRA) granted accreditation to eight private warehouses. 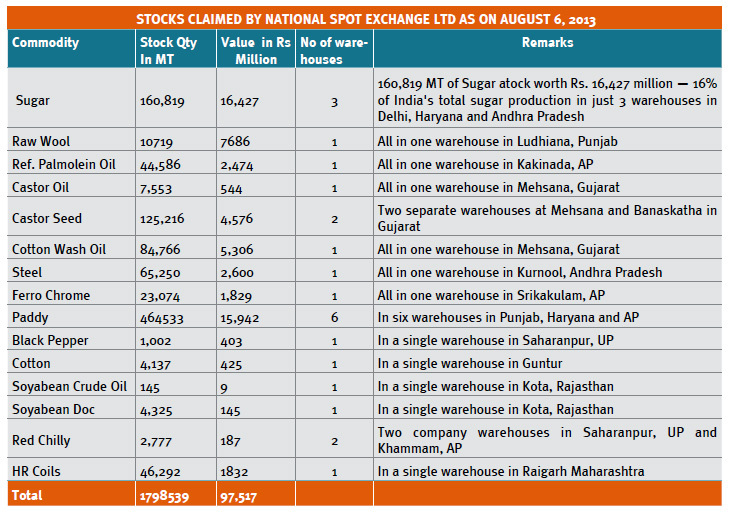 Did it grant accreditation to NSEL’s warehouses? Did it not matter that all of them seemed to be under the control of its largest member-borrowers? Has anyone been questioned? What was the role of the National Bulk Handling Corporation, also owned by the Financial Technologies group which set up the initial warehouses? Even powerful civil servants like former SEBI Chairman CB Bhave, who rejected the MCX-SX proposal, as well as SEBI board members KM Abraham and MS Sahoo, found themselves unable to withstand Jignesh Shah’s onslaught. Abraham’s letter to Prime Minister Manmohan Singh, accusing Income Tax Authorities of harassing him ‘at the instigation of officials in the Finance Ministry’, failed to stir a hornets’ nest. Similarly, Bhave, who was entitled to it, was denied an extension, and UK Sinha was brought in as SEBI chairman at the behest of Pranab Mukherjee and his adviser, Omita Paul, allegedly to manage the affairs of some big corporate houses. Meanwhile, when his term ended on July 20, 2011, Abraham, who had earlier been granted a two-year extension and was a frontrunner for the post of Forward Markets Commission (FMC) Chairman after BC Khatua’s one-year extension expired, too became persona non grata. This way, UK Sinha got the Chair and Jignesh Shah exacted revenge. There are also many overlapping and grey areas. For instance, although the Reserve Bank regulates the currency market, currency futures exchange is regulated by SEBI.WHAT IS GOOD FOR JIGNESH SHAH IS NOT NECESSARILY GOOD FOR INDIA AND ITS ECONOMYIn 2003, when MCX started, there were as many as 24 regional commodity exchanges which were functional. Most of them have got wiped out. Today, 17 out of 21 Registered Exchanges have not traded for the past five years; 13 of them have not done anything in the last 10 years! This shows how a handful of exchanges are monopolising the market for their individual gain, and no one is bothered about the nation or the economy.Strangely, a number of the Government’s regulatory steps since 2003, like those relating to open position, margin or delivery of agricultural commodities, adversely affected MCX’s opponents, NCDEX and NMCE, but MCX was not affected. For instance, following the Abhijit Sen Committee report when the government banned trading in pulses, wheat, rice, tur, urad, chana (chickpea), soya oil, potato and rubber in 2007, almost 85 per cent of NCDEX’s business was in the doldrums. But MCX recorded a 47 per cent increase in turnover during that period. 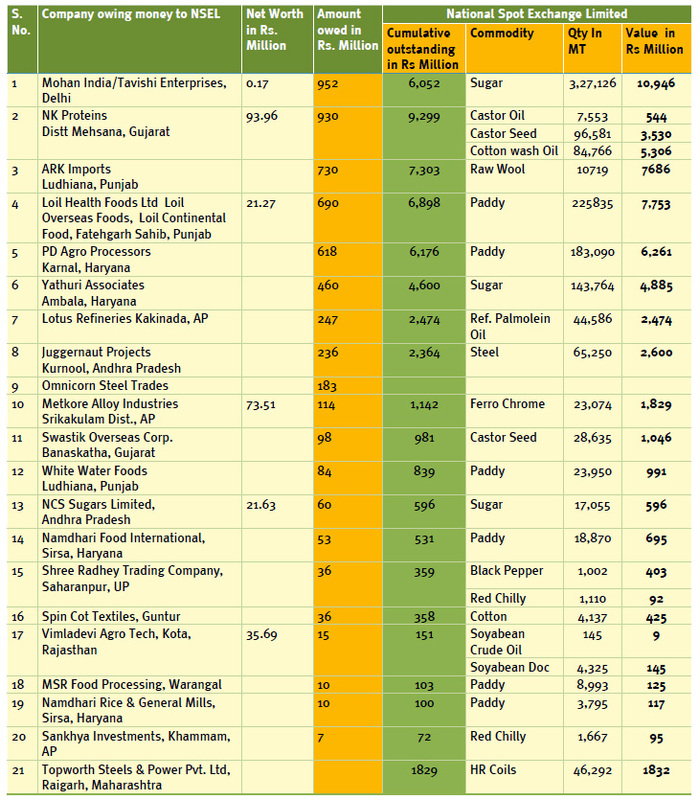 Again, in 2012, when prices of mentha oil, pepper, chana, soybean, mustard seed, refined soya oil, crude palm oil, gur (jaggery) and barley touched life-time highs, the FMC reacted by banning trading in guar gum and guar seed and reduced position limits in the nine commodities. Again, MCX was not affected. MOST of the 24 firms and members of the NSEL are unknown names and the nature of their business is unclear. NK Proteins is a Gujarat-based edible oil manufacturer, having total assets of Rs 564.47 crore and net profit of Rs 15.2 crore at the end of March 2012, as per latest records available with the MCA. The company owes more than Rs 967 crore. The firm is a promoter of BSE-listed NK Industries Ltd, whose shares are suspended from trading and which has a market cap of just Rs 20 crore. Mr Shankar Lal Guru, who is the father-in-law of Nilesh Patel, MD of NK Proteins, was Chairman of NSEL till recently and resigned in the last week of August. Ark Imports, which owes Rs 719.42 crore, had total assets of Rs 124.11 crore and a net annual profit of Rs 7.77 lakh, at the end of March 2012. It could not make any payment to meet its dues for the first weekly payout itself. Loil Continental, which owes Rs 335.15 crore, had total assets of barely Rs 14.69 lakh and a net annual profit of Rs 8.71 lakh, at the end of March 2011, as per latest records available with MCA. Loil Health Foods Ltd, which owes Rs 289.12 crore to the NSEL, had total assets of Rs 71.45 crore and a net profit of Rs 11.41 lakh at the end of March 2012. Mohan India Pvt Ltd, which owes a total of Rs 575.08 crore, paid Rs 25 crore to NSEL against its weekly obligation of Rs 28.75 crore. This firm, according to the MCA, had total assets of just Rs 17.10 lakh and an annual profit before tax of just Rs 2,044 at the end of March 2012. It is surprising how the company managed to pay Rs 25 crore. Juggernaut Projects Ltd, which has built an unsettled position of Rs 220.20 crore, was formed on April 4 and commenced business only on July 10, according to MCA filings. Since all trade in one-day contracts on the NSEL was suspended by July 31, it essentially means the firm built its positions in a short span of 20 days. As alleged by Kirit Somaya, the promoter of the firm is actually working as a peon with a big broker. Tavishi Enterprises, a Delhi-based firm, owes Rs 333.01 crore to NSEL, and was incorporated on January 24. Similarly, another little-known name is PD Agro processors, which has to pay dues of Rs 644.55 crore to NSEL investors. 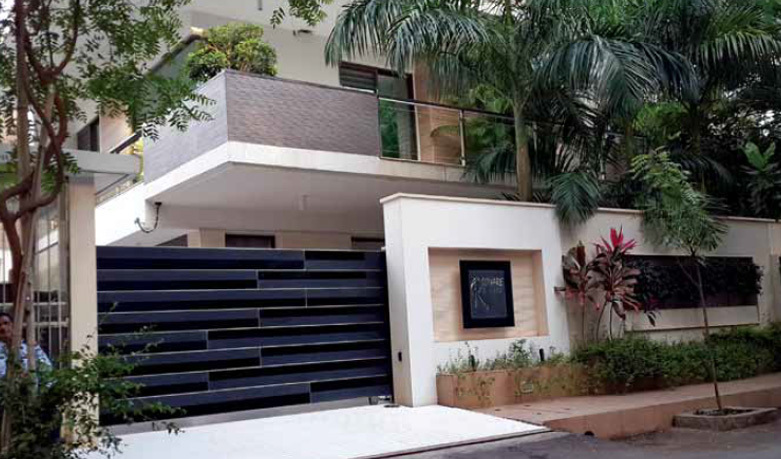 It could pay just Rs 5 crore, against its weekly dues of Rs 21.48 crore. The original concept behind the National Commodity Exchanges was of not-for-profit self-regulators, who might ensure discipline among the members. But a conflict of interest started when the regulatory role was compromised to make profits. Is it a mere coincidence that, just six months before MCX became operational, the Government, on April 1, 2003, vide notification under Section 15 of FCRA, permitted futures trading in as many as 110 commodities? Significantly, the Gazette Notification, among other things, lifted the four-decade ban on gold, silver and crude oil trading. This was like putting the cart before MCX, which used it as a springboard to leverage itself as the world’s largest in gold/silver trading, second largest in natural gas and third in crude oil trading, in terms of number of contracts traded. Even today, six non-agri commodities, including gold, silver, copper and crude, contribute 90 per cent of MCX’s turnover. The agricultural commodities are low-priority operations, just for show. The commodity exchanges were supposed to enable farmers to hedge price risk. This, though, has remained an unfulfilled dream as most farmers cannot afford to pay the heavy membership fee to become a member of the exchanges. Apart from this, the minimum lot size for trading in the futures market is much more than the marketable produce of most medium and small cultivators, who lack the skills needed for trading on electronic exchanges. There are also no terminals in the villages; as a result, commodity exchanges are nothing but rich persons’ casinos. The business of commodity exchanges is thriving while the percentage of agri-commodities has declined from 19.5 in 2007-08 to 11.8 in 2012-2013. Also, as per FMC data, more than 99.9 per cent of all trading in commodity exchanges is speculative — without any physical delivery. It is the only market of its kind where the seller has no real need to sell (things they don’t even own like weather or crude oil) and the buyer has no need or intention to buy or accept physical delivery and stock it. 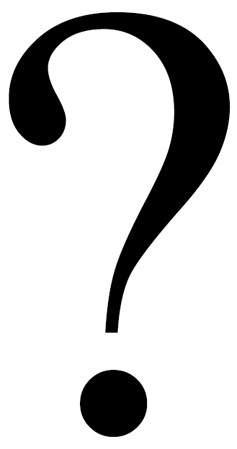 What possibly could a person do with crude oil when he does not own a refinery? Is this what India wants? Is this what the country, its economy and people deserve? The National Spot Exchange scam is almost parallel to Harshad Mehta’s forged receipt scam in 1992-93. The NSEL is a part of Financial Technologies (India) Ltd (FTIL), promoted by Jignesh Shah, who, among others, owns MCX Commodity Exchange and MCX-SX Stock Exchange. The NSEL spot trading platform for commodities began “live” trading on October 15, 2008, and controls 99 per cent of the market. The trade at the Spot Exchange starts with the seller bringing his goods, which are weighed and checked for quality. Once okayed, a warehouse receipt is issued. The seller deposits the receipt at the designated Spot Exchange. This sets the quantity he can trade on the Exchange. Finally, the buyer and seller mutually agree to a price and delivery, and settlement is done. In June 2007, when the Government granted a licence to NSEL, the underlying idea behind this was that the futures market could not function efficiently without an efficient physical market. Many commodities are traded in both spot and futures markets. The spot market is for trading today, whereas the futures market is for future delivery. A forward contract is a legal commitment made by a seller to deliver a pre-specified amount at an agreed time at a particular price. Spot Exchanges were supposed to be electronic trading platforms similar to mandis for spot delivery contracts for sale and purchase of agricultural commodities, metals and bullion. This was supposed to be an innovative Indian experiment in the trading of goods and a form of direct marketing by sellers of commodities, distinct from what was commonly known as “commodity exchanges”. Spot Exchanges were supposed to leverage the latest technology for trading of goods. Spot Exchanges were supposed to be an electronic market where a farmer or trader could discover the prices of commodities and buy or sell goods immediately to anyone across the country. All contracts on the Exchange were compulsory delivery contracts, i.e. at the end of the day the seller had to give delivery and the buyer had to take delivery on a net basis (intra-day squaring off was allowed). Another mandatory requirement was ‘ready contracts’, meaning a contract which provides for the delivery of goods and the payment of a price, either immediately, or within a period not exceeding 11 days (T+10 contract) after the date of the contract. The NSEL’s mandate was only to offer a spot trading platform. The NSEL is not a recognised forward contract exchange like MCX. But, as a shady package deal, traders were allegedly allowed to take positions in NSEL and sell the same on MCX — which is not the same thing. Also, it was operating T+25 contracts right from the beginning and pairing trade of T+2 and T+25 or T+2 and T+35 — which has no legal basis. The more-than-11-day contracts’ tenure was illegal. But who cares! The NSEL started offering assured returns of 12-15 per cent or more for speculation; as a result, its business boomed. 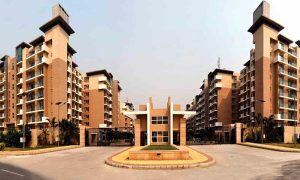 It achieved a turnover of Rs 2,182 crore by the end of the first year in 2009, and its daily turnover touched Rs 1,000 crore. Today, spot trading is a minuscule part of its total business volume of Rs 3 lakh crore and reportedly most of its revenue comes from forward contracts, for which it has no mandate. A closer examination of castor seed for January 2013 clearly shows that no change occurred in the open interest of D-3 and D-36 days. What does this mean? THE PAUL JOSEPH EFFECT: A Ministry of Consumer Affairs notification, dated June 5, 2007, signed by Paul Joseph, helped to keep NSEL trading in a regulatory vacuum from June 2007 till February 2012. Probing deeper, one learns that howsoever favourable, Joseph — then Principal Adviser, equivalent to Secretary — could not have taken the policy decision entirely on his own. A big secret that people in the Consumer Affairs Ministry are trying to hide is that at the time Sharad Pawar was the all-powerful minister holding dual charge of agriculture and consumer affairs. Yashwant S Bhave, a 1972-batch Maharashtra cadre IAS officer, who succeeded L Mansingh, was Secretary, Ministry of Consumer Affairs, Food and Public Distribution. It is alleged that it was on Pawar’s instance that Joseph, who was nearing retirement, extended this favour to the NSEL. This created a lot of confusion as agri-commodities are covered under the Agriculture Produce Marketing Committee Acts, but metals were outside their purview. The Spot Exchanges also exploited the fact that intra-State spot trading is a State subject, while inter-State trade is covered under the Union List. Also, though “Stock Exchanges and futures markets” are covered under Section 48 of the Union List, there is no reference to electronic spot exchanges. Though forward contracts are not permitted on Spot Exchanges, the NSEL was exempted to undertake 1-day forward contracts. But, while Joseph specifically stressed the need for physical delivery and not allowing any short-selling on the exchange platform, the NSEL took the lead in flouting this. Since the very beginning, short-selling, a trading strategy in which investors sell without owning an asset, has been one of the rampant malpractices at the NSEL. As part of the strategy, processors/stockists were allowed to sell commodities on a T+2 basis, without actually depositing the commodity in the exchange-accredited warehouse. Another blatantly illegal but popular product was vyaj badla, an ingenious risk-free guaranteed return scheme where the financier held a warehouse receipt for the goods and the NSEL stood counter-guarantee for any failed transaction. As part of a pair trade, or vyaj badla cycle, a mill-owner may buy a commodity from the NSEL, or from a mandi, using cash or agri-financing from a PSU bank. These stocks were stored at warehouses owned or rented by the mill-owners, who would enter a long-term higher price forward contract to buy the stock from the financier at the end of 25 days or 35 days. In the process, the mill-owner may recover his money and the financier got the difference between the two contract prices — approximately 14-16 per cent per annum returns. The NSEL violations were first noticed in May 2011, when a sub-committee of RBI and Consumer Affairs Ministry officials was apprised about the lack of regulatory measure in the Spot Exchanges. But nothing happened for eight months. Though the Government woke up and brought the NSEL under the purview of Forward Markets Commission (FMC) in February 2012, yet nothing much changed on the ground except the NSEL being made to furnish weekly and fortnightly trade data. Even as early as February 21, the FMC knew of 55 contracts having a settlement period of more than 11 days, and instances of short-selling. Why is it that, despite the Ministry of Consumer Affairs (MCA) and FMC finding large-scale violations as early as April 27, 2012, the NSEL was allowed to continue for 16 months, till August 6, 2013? For close to two years, the Government kept dilly-dallying. Though the FMC submitted a draft legislation for regulating Spot Exchanges to the Ministry, and the MCA issued a showcause notice to the NSEL on April 27, 2012, there was no follow-up action. Finally, the endgame began on July 13, 2013, when the MCA ordered the NSEL to settle all existing contracts by their due dates and not issue any further contracts. The NSEL had a practice of deliver-now-pay-later contracts; the FMC wanted this to stop. When the NSEL informed its members that henceforth contracts would have to be settled within 11 days on a trade-to-trade basis — that is, payment against delivery of the commodity — the forward traders were not interested in spot trading and demanded settlement. As a result, the Exchange ran into trouble. It is alarming as to how the Settlement Guarantee Fund (SGF), comprising cash, FDRs, bank guarantees or assets, has shrunk from Rs 839.53 crore on July 29 to Rs 65 crore now (see table below). The purpose of the SGF is to ensure that all stakeholders are not affected in case of default. The shrinking of the SGF only means one thing: powerful politicians and bureaucrats — the hidden investors — are abandoning the sinking ship and being paid off on the sly. Strangely, the Kabra Committee’s recommendation not to allow futures trading in wheat, pulses, non-basmati rice, tea, coffee, dry chilli, maize, vanaspati and sugar, fell on deaf ears. This was despite a UNCTAD and World Bank Mission Report suggestion that futures trading in commodities like wheat, rice and sugar was unlikely to be viable. Many of the warehouses and stocks claimed by the company appear to be suspect, as quite a few warehouse-keepers appear to have issued forged or false documents. In many cases, where warehouse-keepers were themselves involved in trading, what was the sanctity of their declaration and receipts as they could always manipulate the stock position? In some cases, the stocks were pledged to more than one financial institution. In most cases, actual stocks do not tally with the quantities mentioned in the warehouse receipts. This only means that fake warehouse receipts were being used. For instance, according to the NSEL’s latest stock position, on July 26, 11,190.5 tonnes of raw wool —almost a quarter of India’s annual wool production — are stored in the warehouse of ARK Imports in Ludhiana. Can you imagine 10-12 per cent of India’s wool consumption lying in a single warehouse? The stocks of jeera, shown in the NSEL’s two warehouses at Unjha in the Shivganga area, are reportedly pledged to ICICI Bank. Similarly, Mohan India warehouses in Delhi, where the NSEL claimed to have deposited sugar stocks worth over Rs 1,000 crore, reportedly have to recover Rs 150 crore from the NSEL. Likewise, large-scale discrepancies can be found in stocks of paddy, sugar and wool. Raw wool, castor seed, castor oil, cotton wash oil, paddy and steel were some of the favoured traded commodities, inviting between Rs 3-10 lakh investment from small and medium traders — at least 10,000 of whom lost their hard-earned money in the NSEL scam. The list of borrowers includes Namdhari Rice & General Mills (established in 1986) and Namdhari Food International, Sirsa, Haryana (established in 1983, first export in 1995), which NSEL claims has an outstanding of Rs 631 million against 22,665 metric tonnes of paddy, valued at Rs 712 million. Interestingly, no information is available about the Company on the Ministry of Corporate Affairs portal. gfiles spoke to its Managing Director, Daljit Singh, who claimed that paddy is usually stored in the open and whatever limited number of covered godowns his company owns, that are used for storage of rice. At this time, there is no paddy in stock. He also claimed that his company does not owe anything to NSEL; rather it might have to take something from NSEL when the accounts are finally settled on the 10 per cent margin they were offered when they began trading on the NSEL platform. 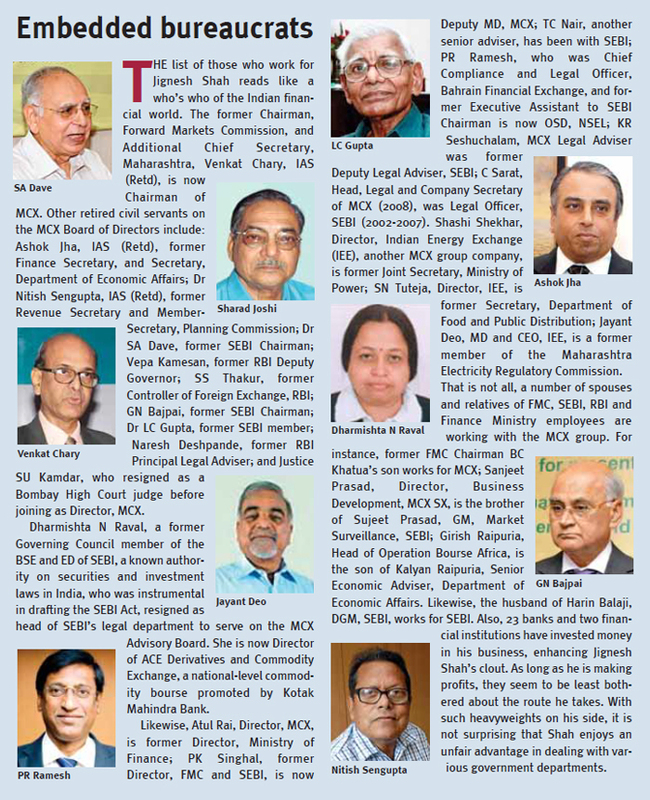 Though the NSEL has appointed a four-member independent committee — comprising GN Bajpai (ex-Chairman, SEBI), D Sivanandan (IPS, Retd), Sharad Upasani (IAS, Retd) and Justice RJ Kochar — to oversee the settlement process, it remains to be seen what the committee does as some of its members, including Bajpai, are working with MCX. Thorough investigation into the functioning of the entire Jignesh Shah group of companies be conducted in a coordinated manner by all the investigating agencies of the country, including the Central Bureau of Investigation (CBI), Income Tax Department, Serious Fraud Investigation Office (SFIO) of the Ministry of Corporate Affairs (MCA), Directorate of Revenue Intelligence (DRI), Enforcement Directorate, Economic Offences Wing of the Ministry of Finance, Central Warehousing Corporation (CWC) and other such agencies. Besides SEBI, FMC and the Ministry of Consumer Affairs, the Competition Commission of India (CCI), should also be roped in since the NSEL, with a market share of 99.99 per cent, can be defined as a dominant undertaking coming under the purview of the CCI for all its allegedly irregular behaviour in the market space. An integrated approach on the part of all these agencies alone can track the money running into thousands of crores of rupees that has been siphoned off and find out how the money lent by thousands of investors has been deployed. Pending settlement of the NSE defaults, all assets of Jignesh Shah and his companies, including the associates and subsidiary companies, be frozen. The NSEL, or any of the group companies of Jignesh Shah, be debarred from entering into any new financial transactions/commitments/payments, till the investigation is complete and all financial obligations arising out of the default of the NSEL are settled. Jignesh Shah and key officials of all his companies be debarred from leaving the country without explicit permission of the Court. In view of the significant co-relation between the price rise of essential commodities and the functioning of these exchanges, as also the number of suicides committed by investors in such exchanges, it is prayed that all commodity exchanges of the country should be closed until a clear regulatory mechanism is put in place. To ensure effective regulatory mechanism for the functioning of such exchanges, a high-power committee be appointed to lay down the rules of the game. Electronic exchanges for agriculture commodities have not been permitted in the Constitution. Appropriate strictures be passed against those who have violated the Constitution of India in letter and spirit.